Operation Hunger is an NGO that undertakes nutrition and community self-help projects in the informal settlements, the shanty towns that stretch for miles along the Cape Flats, southeast of Cape Town. Operation Hunger is an NGO that undertakes nutrition and community self-help projects in the informal settlements, the shanty towns that stretch for miles along the Cape Flats, southeast of Cape Town. In the apartheid era, the government established townships for blacks outside the cities, bussing them to and from their workplaces while enforcing residential and social segregation. De facto residential segregation remains, with stark differences between the block houses of the townships and the upper middle-class suburbs and gated communities at the foot of Table Mountain and along the western coastline. If the townships are poor, the informal settlements are even poorer—mile after mile of small shacks built from scraps of wood and metal, many with no electricity, running water or sanitation. Most residents arrived from rural areas, looking for work in the city. Unemployment is high—60 per cent was the figure most often quoted, but it could be higher or lower because many migrants are undocumented, and few have permanent jobs. Some women find work as domestic help or market traders; men gather early in the mornings at the roadsides, hoping for a day’s work on a construction site or picking grapes in the wine lands of the Stellennbosch, east of Cape Town. Government efforts to move or resettle the migrants have had mixed results. New houses, which look much like the houses of the township era, are being built, but most families cannot afford the rent, let alone utilities. The cycle of generational poverty is difficult to break. With a small staff, Operation Hunger runs health education and tuberculosis programs and teaches people how to make bricks, raise poultry, and grow vegetables and fruit in garden plots. 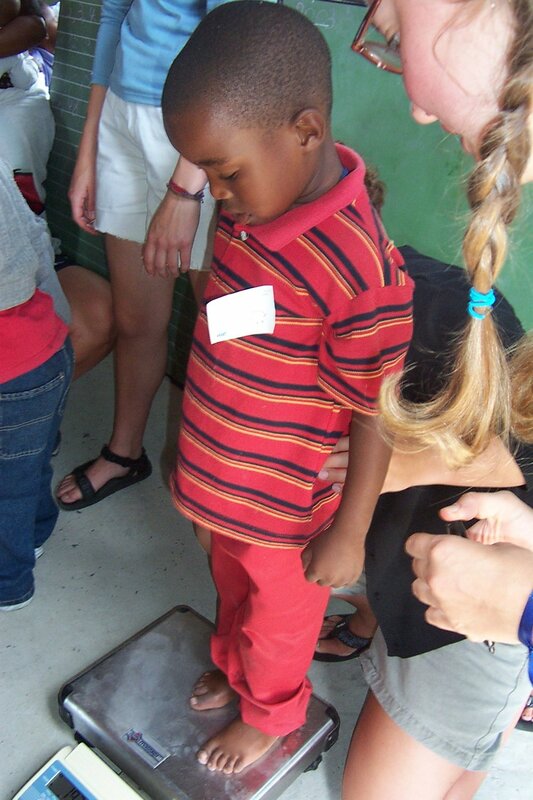 I led a student group that took part in the NGO’s nutrition surveillance program, weighing children to see if they were within the acceptable range for their age. Operation Hunger follows up by providing food and counseling to families with underweight children. Figuring out which families need help is challenging. Some lack birth certificates or health clinic cards and cannot afford the bus fare to the government office to obtain the documents. There is also social stigma. It’s difficult for people to admit that they can’t feed their children, so parents whose children have been identified as “at risk” may stay away from the weighing session. Nonetheless, over one long day, the students weighed more than 160 children in the Xhosa-speaking settlement of Green Park and the “colored” (mixed-race) Afrikaans-speaking settlement of Spandau. While some did the weighing, checked documents and recorded data, others played with the children and distributed candy, packet soup, pens, pencils and toys. At Green Park, where the weighing sessions were held at a pre-school, with the help of teachers, things went smoothly. There was no public building at Spandau and a crowd gathered as we weighed the children on the street. There was jostling as older children tried to grab the goodies; as trip leader, I had to order some students to get back on the bus until the situation calmed. Most of the time I stood by the bus, keeping an eye on a few unsavory characters lurking on the fringes of the crowd. While I was watching the crowd, Stephanie was recording the names of the children and their weights. In Green Park, the children were Bantu, and their Xhosa names unfamiliar to English speakers; in Spandau, the names reflected the Afrikaner influence. Stephanie is fluent in German and quickly learned to ask, “Wat is jou naam?” [What is your name?] in Afrikaans which is close to German. She recorded names such as Johannes, Isaacson, Aaronson, Amsterdam, and the intriguing Wildebeest. There’s always the ethical issue of becoming a “poverty tourist,” of simply observing and recording the living conditions of poor people. Sometimes, that’s unavoidable. On this field trip, led by Operation Hunger’s director, the students felt they had worked and made a small contribution. The director said that it would have taken his staff and volunteers several weeks to gather the same amount of data.